The story has it all. A treasure trove, a Japan-Russia war some century ago, a sunken ship, chests of gold coins worth $130 billion, but might be lacking something: truth. There’s apparently photos on KIOST’s website showing the wreck as well as the map of where the ship is located. Park Sung-jin of Shinil Group called KIOST’s claim fraudulent, further stating that historical records show there was gold on the Dmitrii Donskoi ship. Whats more, there were claims Shinil Group is to ICO with this $130 billion worth of gold that may or may not exist to be used as asset backing. Park Sung-jin however says that the Shinil Gold Coin website, which had their contact information, is not affiliated with Shinil Group. So what exactly is goin on here, who is to know, but apparently they’re going to reveal details of what they claim they have found in a press conference next week. This story might or might not be true with now KIOST’s reputation potentially on the line or that of Shinil Group, but gold’s price is down regardless. Gold has been going down for some time, so maybe this claim has little to do with it, yet you’d think papers and papers telling all that $130 billion worth of gold has been found didn’t help. Gold’s current market cap is around $6 trillion, so if it were true that would amount to 2%. In line with supply and demand you’d think price would go down 2%, or $24, and it sort of has. In bitcoin, of course, these random increases in supply do not happen. Well, in theory anyway. There’s a 21 million limit and that’s it. In practice, however, if Nakamoto’s estimated one million coins moved, then it is an increase in supply as most have discarded them, or once MT Gox’s 165,000 bitcoins are distributed there might be a temporary practical increase in supply. 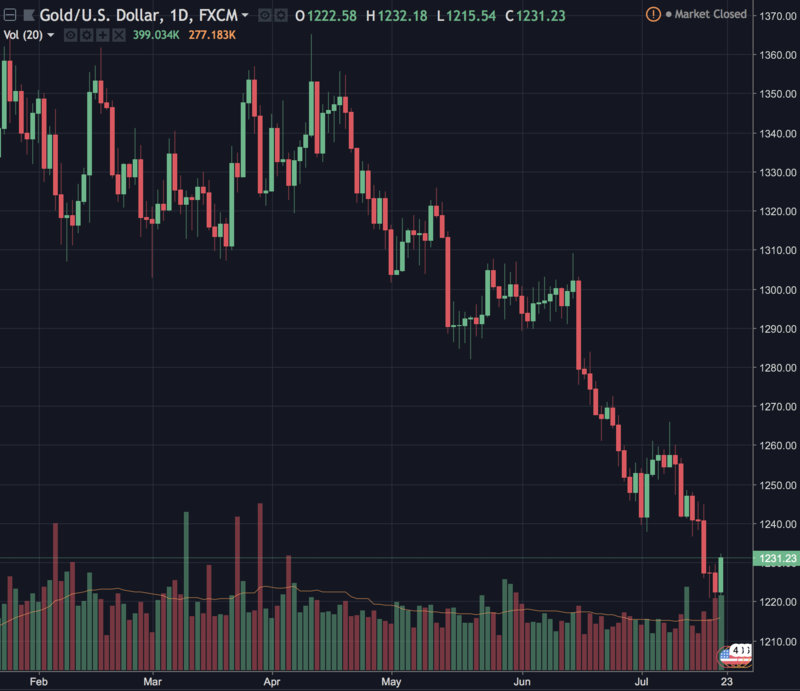 Ethereum doesn’t quite have the same scale of potential fluctuation in practical supply, but with gold arguably it is different because all that XAU in meteors might eventually be excavated and might dwarf the current gold supply. Making cryptos potentially have a far better claim to scarcity because although some coins might go into circulation or out, there can’t be any more than 21 million of them for bitcoin. Thus total supply can not increase as it does for gold, but it can decrease if coins are frozen, keys lost, forgotten, and so on.